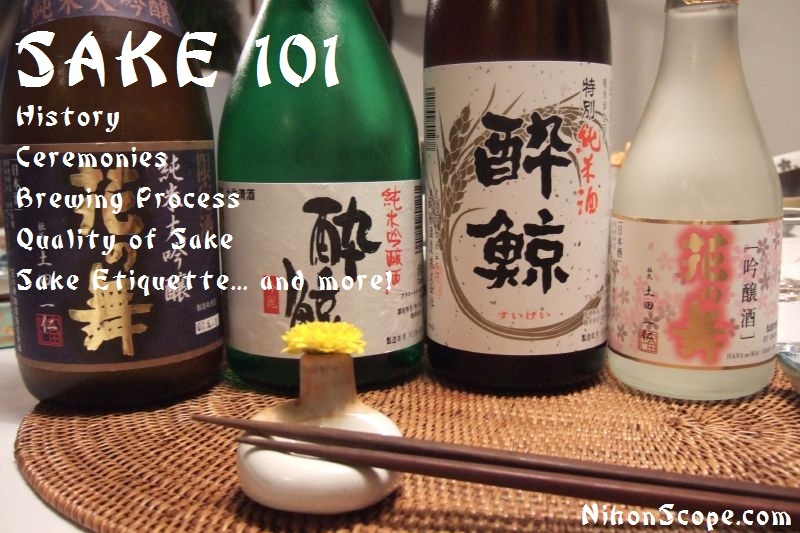 Sake 101 – Understand the Sake… BE! The Sake! So I thought today I would go through a basic run down of the history, the quality, the process of brewing and a great course on how to properly drink sake and the rituals based around this wonderful beverage. By the way, PLEASE: It’s pronounced… “SA KAY” not “SA KI” 😛 Now you know. There are many types of sake and they are designated to a certain quality group over all. In fact the Japanese government has actually created a list of the types of sake and how they can end up using these labels when marketing. 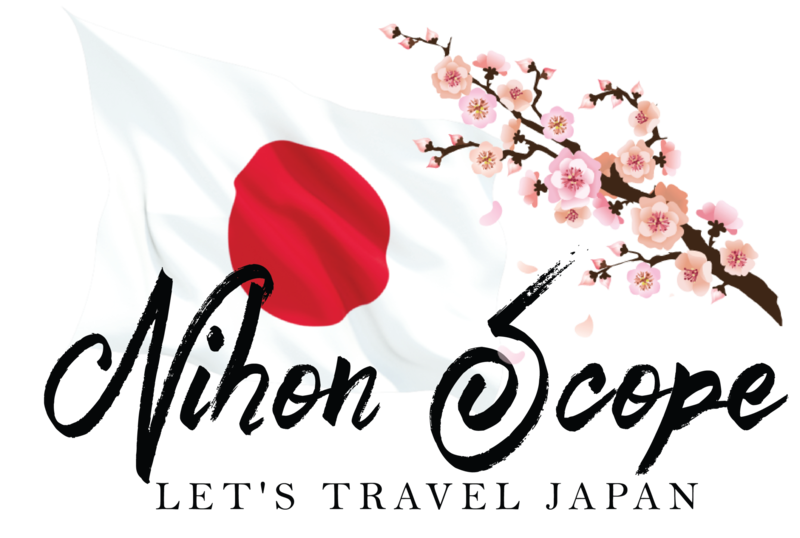 You can view that list near the bottom of this page, but it should show you how important sake is to the Japanese culture over all. 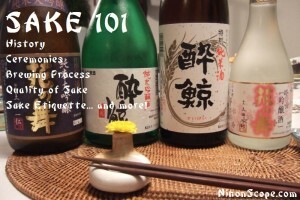 English refers to sake as rice wine, but sake in Japanese (or o-sake) can also mean alcoholic beverages over all. The way sake is brewed (fermented rice) which is a grain, is more closely related to brewing beer. But it’s easily more adapted to wine then anything. Fun fact about sake is that it has the highest natural alcohol content of all alcoholic drinks. Up to around 22%, but after the brewing process, it’s watered down to about 15% to make it so that more flavors are recognizable. Although you can purchase undiluted sake which is called Genshu. But perhaps you are thinking, what about liquor like vodka, rum, whiskey, maotai or cognac? It’s interesting to note that before the distillation processes in these liquors, they only have an alcohol percentage of %6 to %9 percent on average. Thusly making sake the highest naturally fermented alcoholic beverage found in the world. The sake mash has a alcohol percentage of 22% like stated before. In olden times, sake brew masters would operate from autumn to spring, when it’s the easiest to control the temperature. Where as today, sake is brewed all year long because of cooling equipment. Sake is a fermented alcoholic beverage. It contains 11-17 percentage alcohol on average when bottled. It’s viewed as a wine much because it’s created by using rice, which is a cereal grain. But, unlike wine, Nihonshu (sake) has no additives, preservatives and contains no sulfites. So from this view point, o-sake is more so a beer because the starch from the rice is transformed into sugar and the sugar is used to finally become alcohol. The pure nectar of sake is only as good as it’s basic ingredients, so skipping out on high quality water would be a disaster. High quality water, say from places like Kumamoto-shi in Kyushu (the lower Japanese island), are prime waters to use in sake brewing. The most suitable water for making sake is high in phosphoric acid, magnesium and potassium. It must also have low levels of manganese and iron. These minerals can cause the sake to lose flavor and can also discolor the final product. Rice Quality in Sake Means Everything! Since rice is the main key to the quality of the finalized product. It’s important to pick the highest quality rice so the preparations of creating the sake brew is easily adapted through the rest of the process. Sake’s over all quality is determined by how much of the outer kernel-husk of the rice is milled off. Milling of the rice removes the fatty acids and protein, which then simply leaves the starch-inner in the center. Which then is used to ferment into sugar. The more the rice is milled the more the sake increases in flavor and quality by giving it more of a light delicate taste in the mouth. Once the rice has been milled / polished to whatever size the brewery is attempting, they then soak and steam the rice. This is when the water’s quality really comes in handy for premium sake. 15-25 percent is steamed and set aside to make what is called Koji. The rest is then steamed and cooled and is used for the fermentation in the sake brewing process. Koji basically plays the same role as yeast does when brewing wine or beer. Koji is created by dusting fungi spores (aspergillis oryzae) on the steamed rice and set in a high-humidity, high-temperature location for 2 days. Koji then is placed in water with some yeast and mixed up. The steamed rice placed aside for fermentation is then added, and at this time the yeast will then increase and multiply, this is when fermentation truly begins in the process of sake. Soon the fermentation will start to create a mixture of solids and liquids. The liquid is removed by filtration, which then becomes sake. Once it has been extracted, it’s then pasteurized at about 62 C (or 140 F) to terminate the enzyme activity in the sake. It can also be filtered extra fine to remove the enzymes instead. Can you Cellar or Store Sake? Overall, no. It’s not recommended. It’s best to drink sake within a couple months (unopened) after purchased. Once it’s open it’s recommended to drink it within a couple weeks and its recommended to keep it in the refrigerator at that point. But there are many factors when it comes to cellaring Sake for the long term. This type of sake is called Koshu. And it’s recommended to store it in sub-zero for the long term. But some brewers have some sake from the early 2000’s that they left at room temperature that they are finally cracking open and selling to their customers. Koshu sake is sort of considered a bit taboo when it comes to it’s process and drinking. But more and more people are finding that this is a brave new world when it comes to sake. I’d say do your research if you plan to personally age your sake to Koshu and perhaps buy some before attempting the long haul of cellaring it. Sake has a history of more then 2000 years and counting. The origins of sake can be tracked down to the Yangtse River Valley in China which then dates as far back as 4,000 BC! Sake made it’s way to Japan in 300 BC and it was the Japanese that took the opportunity to mass brew this most delectable beverage. Since the beginning of sake’s emergence in Japan it has been controlled. At first sake was only brewed for the Imperial Court in Kyoto as well as for Shinto shrines and temples. A department of sake was established in the Yamato Era in the Nara area. This department was created to insure that there was a good harvest of sake for annual festivals, which of course tied into religious offerings. Before it was known that koji could be used to create sake, it was very common that in these early days of sake that a whole village were involved in what they call “Kuchikami no sake” (chewing mouth sake). Which basically means that a bunch of people chewed rice and nuts and then spit into a barrel in the middle of the village, which then would later become the base for brewing their sake. I’d say that overall that wouldn’t fly today. Thank god for koji right? During the Meiji Restoration (1868), it was passed as law that the general Japanese people could start construction and operate their own sake businesses. Soon after this law passed (1 year exactly) over 30,000 breweries opened up inside Japan. (kind of reminds me of the Marijuana business in Colorado). But with this came HUGE taxes on these breweries, and after a couple decades there was only 8000. (just like the MJ business in Colorado). Sake is a high taxable product in Japan. In 1898 more then 40% of the general tax income was from sake alone! Today sales tax only equates to around 2% of their total tax income. The quality of sake gradually went down during and after WWII when the Japanese government limited the possibility of using rice in production of alcohol and thus glucose was added which created a very poor quality sake. Since then, the quality of sake has been improving steadily even into the 21st century. But to date the JSBA (Japan Sake Brewers Association) now represents only 1,800 brewers in Japan. From the tip of Hokkaido all the way to Okinawa. For the 2000 years that sake has been brewed in Japan, it has been used in every sort of ritual, festival and ceremony you can run across in the Japanese culture and history. Sake is a main part of many Shinto purification rituals. It’s similar to say the wine of the christian and catholic churches. Shinto have several different cleansing ingredients that can be used. Water, Salt, Fire, Sand… and of course Sake. These temples and shrines started to brew sake in the 10th century, which then became the center of sake production for over 5 centuries. 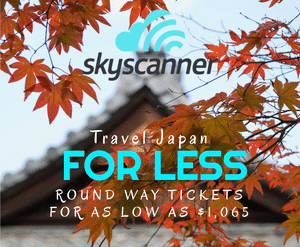 Shinto festivals are responsible for a common sake ritual used even today. During their festivals there was a ceremony called kagami biraki which means ‘opening the mirror’. 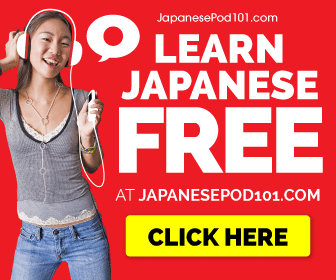 It’s referred to Kagami mochi (which means – ‘breaking up the rice cake’). Kagami mochi is when wooden casks of brewed sake are opened with a mallet. Which usually takes place at temples, company openings, weddings, election and sports victories or any other type of significant event. This sake is called iwai-zake which means celebration sake and is freely given to all to spread good luck and good fortune. During the new year, many Japanese will drink a health tonic sake called toso, which is made with Chinese medicinal powered herbs. Toso is similar to iwai-zake and this concoction is soaked over night, and children will even take a sip of this tonic. This new year sake ritual was borrowed from the China by Japanese aristocrats in the Heian era (794-1185 AD). The ritual consists of three sizes of cup, called sakazuki. The smallest is the first filled with tososan and each family takes a sip starting with the head of the house hold. Once the first cup is drank, the second and third are filled with different types of sake to be passed around. Over all there are two basic sake types. You have Futsuu-shu which is Ordinary Sake and Tokutei meishou-shu which is a special designation sake. Futsuu-shu is the equivalent to table wine. Futsuu-shu accounts for the main portion of sake brewed over all. *2. Amount of distilled alcohol should not axceed 10% of rice weight. In honjozo-shu, the emphasis is on flavor and there is little ginjo-ka or aging‐induced aroma. It has a　reasonable level of acidity and umami and rather than asserting the aroma and taste of the sake itself, it helps to bring out the taste of food. Sake varieties are also distinguished by brewing method. Sake brewed during the current year. Matured Sake that has been stored for a long time. Period of maturation can be authenticated. Undiluted sake. Many genshu have a high alcohol content and have strong taste, because there is no addition of water after pressing. Junmai-shu or honjozo-shu that has been brewed using certain traditional methods. Usually, sake is pasteurized twice before being bottled. Namazake （Nama-shu) is sake bottled without being pasteurized at all. Nama-chozo-shu is sake pasteurized only once at bottling after maturation. Namazume-shu is bottled sake pasteurized only once before maturation. 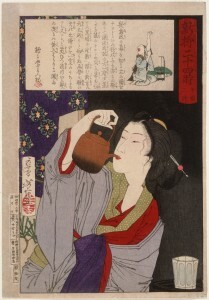 This term derives from ancient Japanese book Engishiki, which records a unique mixing process, shiori, using sake instead of water in the brewing process. There are sub-varieties of Kijoshu, such as koshu, namazake etc. The term means junmai-shu brewed at only one brewery, rather than having been blended from more than one brewery. Cask sake. sake that has been kept in a cedar cask, has its own special aroma. This is an old-style way of marketing namazume-shu. It refers to sake that has been pasteurized only once and aged from the winter until the following fall before marketing. The moromi is filtered through a coarse cloth which produces cloudy sake, called nigorizake. In the past, it was unpasteurized and contained living yeast. However, these days, much of the nigorizake is pasteurized to stabilize the quality. –and on a side note for those who enjoy interesting drinks, be sure to check out habu sake here, it’s not for the weak hearted.